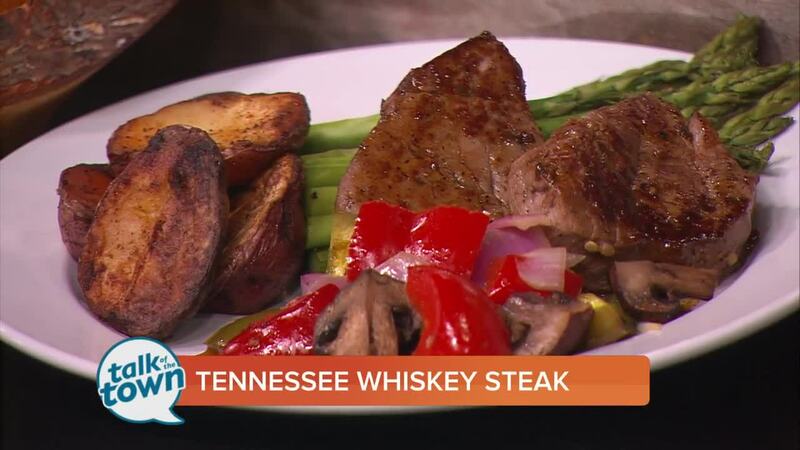 Chef Christopher Newton made Tennessee Whiskey Steak and shared tips for cooking steaks without a grill. (see recipe below) To contact Chef Christopher for catering services call (615) 644-7008 or (615) 452-1912. Chef Christopher's new Tennessee Whiskey Steak Sauce is available at: Mike’s Foodland in Westmoreland, Don’s Farm Fresh Produce in Gallatin, Someone’s in the Kitchen in Hendersonville and Cafe 31 at the Library in White House. For more information, visit www.chefchristopherscatering.com . Don’t Miss the 2019 Sumner County Bridal Show on Sunday 1/27 from 12pm-4pm at the Epic Event Centre in Sumner County. To register, go to www.sumnerbridalshow.com . Marinate steak in oil, salt, pepper, and garlic. Place meat in preheated sauté pan on medium heat. Sear on 1 side approximately 4-5 min. Turn steak over and add onions, peppers, and mushrooms. Cook approximately 4-5 min occasionally stirring vegetables. Add TWSS and bring to a simmer for approximately 2-3 min.